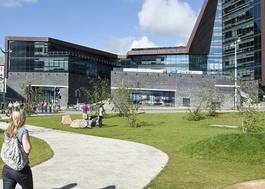 Study Business Management (2 Year Degree) at University of Plymouth - Which? 88 - 96 UCAS Tariff points, including a minimum of 2 A Levels. Including a minimum of 2 A Levels. * Gain a full honours, Chartered Management Institute accredited degree in just two years. You’ll also be eligible for a CMI Diploma in Leadership and Management upon graduation. * Demonstrate your commitment and determination to get to the job market or postgraduate studies as soon as possible. * Benefit from reduced costs – you'll have a year less in terms of fees and outlay for accommodation and living costs. * Fulfil your potential by developing the skills, knowledge and experience needed to build your career in the competitive world of business. * Boost your employability with paid, real-world experience during an optional work placement year. * Focus on the practical aspects of management including strategy, ethics, corporate social responsibility, sustainability, decision making and self-evaluation. * Choose to specialise in your preferred area of interest during your final year and graduate with a named degree in Business Management with: Marketing, Leadership and Human Resource Management, Leadership Practice, Operations Management, International Management, Entrepreneurship or Financial Management. * Benefit from learning within a supportive environment where you’ll be mentored by a community of experienced academics. * Sharpen your networking skills: take part in exclusive opportunities and international trips, by joining the Plymouth Management Society. * In the 2016 National Student Survey, 100 per cent were satisfied with the quality of the course; 95 per cent of students agreed staff were good at explaining things; 95 per cent agreed staff made the subject interesting; 85 per cent were in work/study six months after finishing and 89 per cent agreed they got sufficient advice and support. In your first year, you’ll gain a solid understanding of management in a business and enterprise context, focusing on areas such as organisational behaviour, economics, accounting, entrepreneurship and marketing. You’ll also look into the ethical and sustainability issues of business, get the chance to study a language and complete a consultancy project. In year two gain valuable on-the-job experience through an optional placement year. Supported by a dedicated team, you can undertake a paid position within a public or private sector organisation relevant to your interests. In your finaly year you’ll develop your employability skills by increasing your understanding of project planning and decision making, while studying topical management issues. By choosing from a wide range of modules, you can tailor your degree and graduate with a specialist qualification. After your final year during the summer, you’ll increase your understanding of strategic management and complete a research or consultancy project. At the same time, you’ll continue exploring your professional development.